Heat milk and butter, but do not boil. Add vanilla essence and stir into batter. Spoon into 2 x 20 cm greased cake pans. Bake for 25-30 minutes and remove from oven. Whilst the cake layers are still hot, use a cotton thread and “cut” horizontally in halve. Beat the egg yolks and castor sugar together until light and foamy. Sift the corn flour and fold into the egg mixture. Heat the milk until just below boiling and add, in a thin stream, to the egg mixture whilst beating constantly. Heat over medium heat until the mixture thickens. Remove from heat and beat in the vanilla essence. 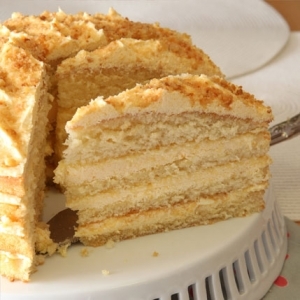 Divide custard into 4 portions and use as filling and topping for each cake layer. Sprinkle with ground caramel, if desired. The cake should be kept in the fridge if not eaten on the day that it was baked.